Custom Monograms are totally customizable and allow you to create your own personalized monograms that can be downloaded and used in any way you can imagine. All you need is some paper, a printer and a little bit of creativity. 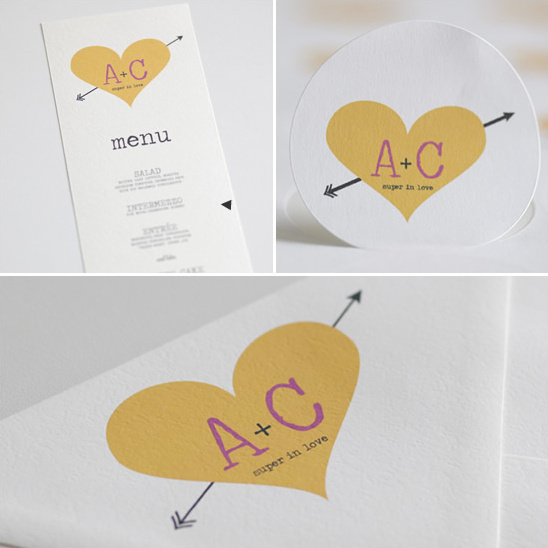 These crazy-cute Heart and Arrow Custom Monograms come in an array of colors. You can get them here but don't miss the free Heart and Arrow Table Numbers Free Download Templates here. It's so easy. 4. have custom artwork emailed to you for all your wedding needs. Amy made and photographed a few examples for you so you can see how they are used. Perfect for your invitations, your menu, labels, candy bags and enveloes OR email to someone you love. Simple, easy and super duper.